Hair often needs a deep conditioning treatment but most of us just do not have the time nor the energy to do a full deep conditioning which involves getting out of the shower, putting the conditioner on our hair, putting plastic wrap over our hair, then a towel and then sitting around for about an hour and then washing our hair out, leaving hair looking and feeling so soft, beautiful and amazing. Who has the time or inclination to do that these days? I certainly do not. Fear not! L'Oréal Paris has the answer! Their new ELVIVE Extraordinary Oil Rapid Reviver Deep Conditioner For Dry Hair is a deep conditioner that provides 2X more nourishment than a leading conditioner while deeply moisturizing the hair. The rich, reviving formula with 20% conditioning serum and camellia + sunflower oil helps to hydrate each strand, for silkier, softer hair. For best results, use after L'Oréal Paris Extraordinary Oil Shampoo. Follow with the Extraordinary Oil Treatment for 10X more nourished hair. Apply to wet hair from lengths to tips after shampooing. Leave on for 1 minute and rinse thoroughly. This conditioner only takes 60 seconds, yes 1 full minute, to penetrate the hair cuticle and condition the hair, leaving it feeling softer, smoother, more hydrated, more moisturized and more nourished than prior to use. It is like using a regular deep conditioner on hair without the wait. This product can be used every day if needed without weighing hair down. I love the way this conditioner makes my hair feel. It gives my hair incredible softness, manageability, decreases tangles that I often have with my hair, makes hair shiny and leave it feeling bouncy and looks a lot less frizzy because there is a lot more moisture in my hair. I could not ask for anything else because of how much I love this conditioner. It comes in other formulas too. 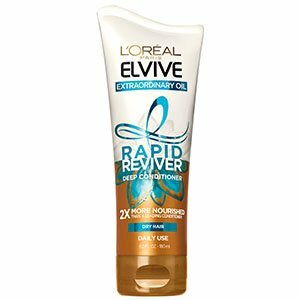 L'Oréal Paris ELVIVE Extraordinary Oil Rapid Reviver Deep Conditioner is available at mass market retailers such as Walgreens, CVS, Rite-Aid, Walmart, Target and Ulta. It is also available online at www.lorealparisusa.com and www.ulta.com. Like L’Oréal Paris on Facebook: https://www.facebook.com/lorealparis; Follow L’Oréal Paris on Twitter: @LOrealParisUSA; Subscribe to their YouTube channel: http://www.youtube.com/user/lorealparisnyc; Follow L’Oréal Paris on Instagram:http://instagram.com/lorealparisusa# and Follow L’Oréal Paris on Google+:https://plus.google.com/104462448073132092737/about.